The Airbus A400M has been delayed again and the earliest the RAF can expect an in-service date is 2014, with deliveries unlikely to start until a year earlier, some seven years later than originally promised. That is a period longer than the whole of World War II. Possibly the in-service date may be even be delayed until 2016, with the aircraft grossly overweight and not fully "mission capable". Oh for those heady days of May 2000 when that wonderful Mr Tony Blair, imbued with the spirit of European co-operation, so presciently decided to order 25 of those shiny new Airbus A400M military transport aircraft. How wise he was to spurn the entreaties of US President Bill Clinton, rejecting the tried and tested Lockheed C-130 Hercules, going for the new dawn of European military aviation, free from the oppressive dominance of the United States. And how pleased the "colleagues" all were, with David Jennings, a spokesman at Airbus Military, welcoming Britain into the fold, even though Germany was not to follow until over a year later. Brimming with confidence, Jennings happily announced that Airbus would launch the programme at the end of the year 2000 and begin deliveries in 2006. However, with the RAF originally expecting an in-service date by 2007, the delivery date started to slip and by 2004 the in-service date had become 2011. But, even if the shine on the Great European Project was getting just a tiny little bit tarnished, up to 6 February this year the RAF was telling us that its 25-strong fleet would be complete by 2011. With Airbus categorically denying "rumours" of delay, it was still looking a bit flakey. But never fear! Those Europeans really know what they are doing. A little late, perhaps, but 2011 it was going to be. Airbus Military has announced a series of delays in the development and production of the A400M programme, and has recently indicated that first deliveries to customer nations will be three years after the achievement of first flight of the A400M prototype. Airbus has indicated that first flight will occur no earlier than the second half of 2009, and has also announced a slowdown in its production plans. Early A400M production aircraft will be delivered to some of our partner nations and therefore the first UK delivery would occur at least six months after Airbus delivers the first A400M. 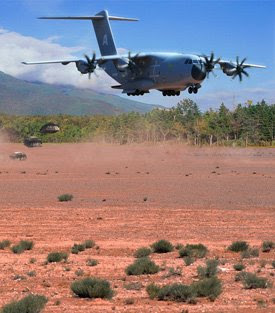 This suggests that initial UK deliveries could not start before 2013 and therefore the estimated in-service date of the A400M (defined as acceptance into service of the seventh aircraft) would be 2014. Hey! Seven years later than the original estimate, with an in-service date now at least three years later than the last estimate of 2011, the shine has most definitely worn off Mr Blair's brave new project. The RAF is in the deepest of deep doo doo. In June last year there were already warnings of "significant risks" that there would not be enough transport aircraft to fly British forces in future operations if there were any delays in bringing in replacements for the ageing fleet of C-130s. Then, as many as nine of the older Hercules C-130Ks had been taken out of service early due to wing "fatigue" and five others are due to be retired next year. Even then, with the A400M not due to arrive until the following year, a grave "shortfall of capacity" was being predicted. By last year we had 42 working Hercules aircraft, but the older C-130Ks were only flying because of a £15.3 million refit, which can only keep them in the air until 2012. That is not the least of the problems. The newer C-130Js are taking such a hammering on operations (plus losses to enemy action) that several could need an intensive refit by 2012. And it gets worse. Because the bulk of the C-130 fleet was supposed to be retired, there is a shortage of engineers and spares to keep the full fleet running. And just in case you were thinking it couldn't get worse, it just has. The delays in the programme are costing Airbus a small fortune and the firm is running out of money. Thus it is indeed slowing down the programme and the MoD's estimates – as of yesterday – are looking unrealistically optimistic. Airbus is now saying that "the first significant wave of operational aircraft would not be delivered before 2014." Since we are down the queue, the chances of us making an in-service date of 2014 are nil. Add another two years at least, sixteen years since Mr Blair's happy little deal. To add to our joys, there are serious problems with the software and the early versions will not be fully "mission capable". Furthermore, the aircraft coming off the production line are 12 tons heavier than planned. Even with a massive weight reduction programme, only seven tons is potentially capable of being removed from later production versions – and then that is not guaranteed. This leaves an aircraft with a slated 37-ton capacity over 1,780 nautical miles coming in as a sub-30 ton machine, compared with the 20-ton capacity of the RAF's C-130Js. But then the C-130Js are currently priced at £38-40 million, against the A400M which at current euro exchange rates works out at £98 million – well over twice the price for considerably less than a fifty percent increase in load-carrying capacity. Then that's "Europe" for you. Twice the money for less performance just about sums it up. But this is not funny. Blair has seriously screwed us – lives are at stake here and our operational capability is seriously at risk. He must be very proud. I am cross-posting this on Defence of the Realm. How about it Mr Brown? Naïve or just plain arrogant? "Far right may benefit in EU poll"